The Maker Faire in Detroit will continue until tomorrow. The photos above and below are from today. In the conference we worked on envisioning and designing schools of the future that have making at their heart. Being in the company of so many energetic, thoughtful, visionary educators is exhilarating and mind boggling. It takes awhile to integrate this kind of experience, so my thoughtful readers will have to be patient for the full effect to be revealed. 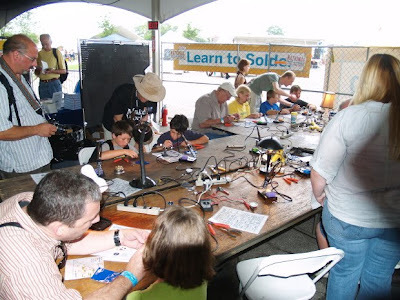 The photos below are some of the more interesting exhibits, one where people of all ages can learn to solder and another where you can just make stuff. The point of course is to get a taste of something that engages one's creative energy, flips the switch that turns one from consumer to maker and provides a glimpse of potential that becomes a target for growth. A neighbor sees a small boy running down the street. “Where are you going in such a hurry”, she asks? “I’m going to my Grandpa’s to help him work in his woodshop”, he replies. “Does your Grandpa pay you” asks the neighbor? “What does he pay you”, says the woman? There is not much of interest that I can report in the blog, except that I am meeting some interesting people and renewing acquaintance with old friends at my conference in Detroit. This afternoon, I will meet with associates of the Big Picture Company, and tomorrow will attend the Maker Faire in Dearborn near the Henry Ford Museum. My rooms are in the Oliver Wolcott building, part of a collection of buildings containing suites of the Dearborn Inn Hotel and Conference Center. 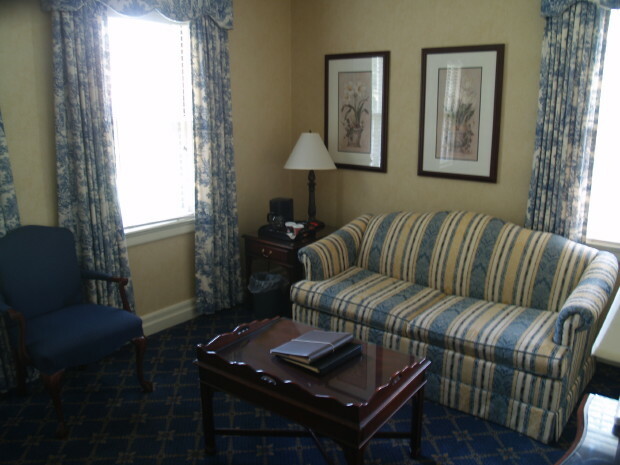 My suite is decorated in an early American style with replica mahogany furniture. As a woodworker, I get under things to see how they are made, and while I'm sorry to report that the furniture in the suite was assembled with nail guns, I'm not complaining. Only the rarest of visitors would take time to know the difference.Oliver Wolcott was one of the signers of the Declaration of Independence. As I have mentioned before in the blog, the hands touch every facet of human affairs, growth, and reality, so surely they offer the best means to give new shape to American education. This evening I had a brief tour of tomorrow's Maker Faire and the photo below offers a preview of attractions. Don't you wish you'd made that? 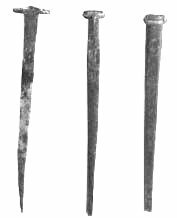 The German word, fingerspitzengefühl "finger-tip feeling" is used for tactfulness, unique insight, and particular sensitivity... as though one has a sense of large and expansive things at the tips of one's fingers. The term hints at the left brain, right brain integration that comes from the creative use of the hands. As you recall, the left brain is tuned to detail and linear processes, while the right brain is concerned with perceptions of the whole, the gestalt, the transcendence of boundaries, and what Jill Bolte Taylor in My Stroke of Insight called nirvana. The left brain is busy arranging things in logical sequence and explaining consequences, while the right is poised on the edge of intuitive response. From a bird brain perspective, as described by Iain McGilchrist in Master and His Emissary, the left brain would be looking for seed in a field of sand while the right brain would be sensing the world for predators, friends and foe, and each form of attention, that of the left and right, is essential for survival. With fingerspitzengefühl, one perceives not merely from seeing the world as a sum of parts, but by seeing only one or two parts representative of the whole, is enabled to gain a clear grasp of the whole thing. It is what we call intuition, or what one might call the wisdom of the hands. I awakened many times last night, in a state of wonder. In my dreams there were things fitting together perfectly in unexpected, inexplicable ways. Remember that the right brain is not the explainer of things. The left brain is better at that, and the right brain's territory cannot be easily put into discursive form. And yet, it is there, as witness to things looming at the edge of explanation. In schools we can measure the ability of children to perform in the left brain arena. We can measure their understanding of words and their retention and proper useage. But what are we doing for their intuition? For their fingerspitzengefühl? What are we doing to enable their translation of inexplicable things? What are we doing to enable their creativity and integration, left and right? And their integration of whole as being greater than the sum of parts? That we have two hands, and two halves of brain, mind, attention, could be telling us something very important, that had best not linger in the forgotten. Imagine we are awakening from a very dreary dream in which the hands were folded at desks and excluded from education. It is a new day. There is a crack of light on the horizon. And I call it the strategic implementation of the hands. Make, cook, plant, sew, create, put your hands to work, in recreation of self. We think that we humans are the only ones to see and make beauty, and yet such narrow-mindedness seems to be another human quality we might need to overcome. 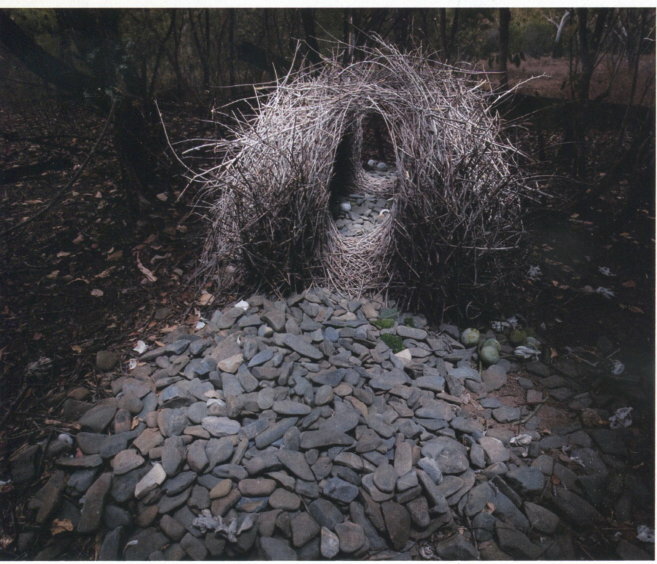 The photo above is a bower bird construction designed to entice a mate. The image is from last month's National Geographic. 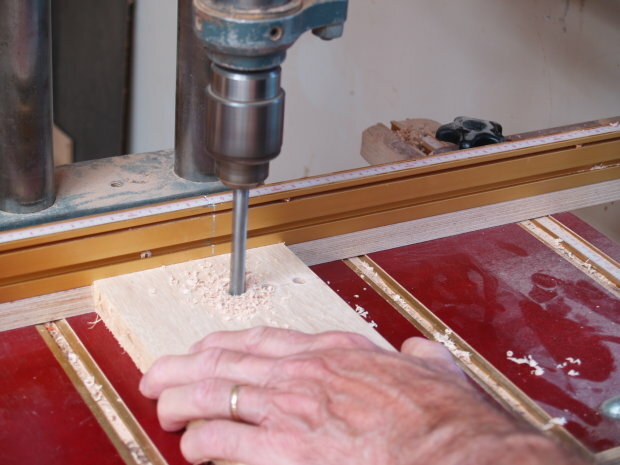 As I begin making two shaker inspired wall cabinets, you might enjoy a bit of nail technology here, and you might enjoy knowing where to buy them. Horton Brasses has a collection, and you can also find them at the House of Antique Hardware. This month's American Craft Magazine features an article about Father Andrew More O'Connor's fashion design. His work has won accolades from Vogue. 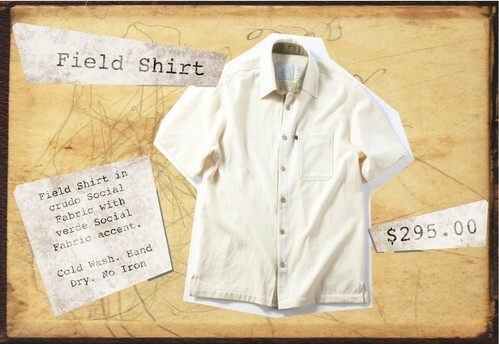 His company, "Goods of Conscience" provides a model for the 21st century, as it utilizes fabric made in Guatemala with workshops in the Bronx and an overriding concern with individuality, "that the hand of the maker is there in the artifact." Making is the foundation of "social fabric", a term Father O'Connor has trademarked, though, I will continue to use it freely on my own without the guilt or remorse associated with Catholicism. While social fabric seems a thing forgotten in our googlicious age of instant information, quick returns (or losses) on the dollar and instant messaging, we human beings are at our best when woven, warp and woof into the tactile fabric of community. Facebook is not enough. We are also able to facilitate the growth of others, in both intelligence and character when we help to set their hands to making beautiful and useful objects. 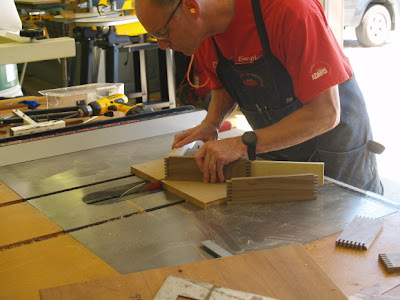 Today in the wood shop, I will be returning my hands to a bit of chip carving, a bit of oiling small cabinets, and a bit of hinge installation as I finish my small spice cabinets. 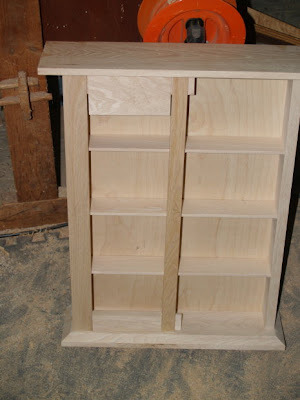 I will also begin work on a couple small shaker wall cabinets in white oak and cherry. Is this art or PE? I continue to be interested in the relationship between the body and the development of mind, and remembered a fad that passed through our small community of artists and healers a few years ago, that of cross-crawling as a means of integrating the left and right hemispheres of the brain. If the subject of left and right brains interests you, you may want to try the exercise. It is easy to do and your own mind and body can inform you of its value. Cross-crawling may also explain why I do some of my best thinking when I go for evening walks. A related bit of information can be found by researching homolateral movement which refers to movements on one side of the body. As a teacher starting in 1944, my mother used skipping as an indicator of successful left-right integration with regard to children being ready to read, so you can see that mind-body, left-right integration is nothing new, just merely forgotten or displaced in American education. Now schools push kids into reading whether they are ready or not despite Finland's school success. There students don't start reading until age 7 but surpass American students in reading and math by 7th and 8th grades. In other words, by attending to crafts instead of reading, students have greater success despite having two years less devoted to the subject. Otto Salomon, in his concern for the body-mind, was an advocate of attention to posture to prevent students from becoming "one-sided" (homolateral) in their physical development. He was also interested in all students (including the children of the rich and famous) learning to work wood as a means for developing all sides of their intelligence. To leave one's physical body untrained in skilled, creative behavior was a deprivation that had implications for all aspects of human culture and economy, and for all levels of society. To leave the upper class untouched by the moral development that results from craftsmanship was a big mistake. 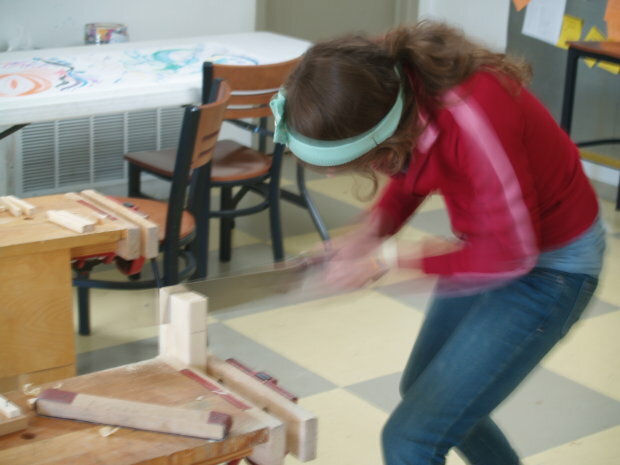 In teaching kids to use their bodies (and tools) to shape wood, once again, attention to posture and fitness, sound, aesthetics and intelligent techniques are essential to reap the full developmental potential. Exercises like cross-crawling were not needed when we were active physically throughout life. But as we sit at keyboards and cease full use of our bodies, simple exercises may help to restore some semblance of intellectual clarity. I am reminded of a question asked by a student when a friend of mine was teaching woodworking in an art class. 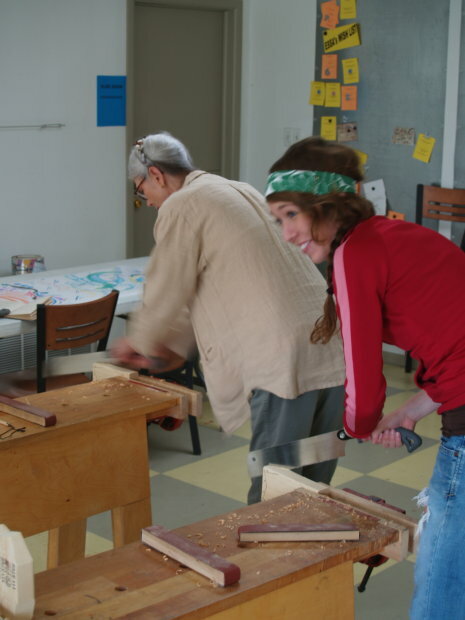 The student was sawing like crazy. "Miss Waters, is this art or PE?" And of course the answer is both. Woodworking is an excellent mind-body training and integration method that we have mistakenly expelled from American education. My daughter Lucy left today for New York, and she will depart for Ghana, West Africa on Friday as part of a Columbia University Engineers Without Borders and Piece it Together combined mission. With EWB, she will be part of a team working to bring clean water to the villages of Obodan and Nsawam. As part of Piece it Together, Lucy will be teaching high school chemistry and biology, so she left with her bags heavily laden with books and teaching materials. You can read about Lucy's projects in the Piece It Together Ghana trip blog. On the way to the airport this morning, Lucy and I talked about the importance of hands-on learning. We all know in our hearts, souls and guts, that we learn best when we are involved hands-on. So, I suspect Lucy's month long non-credit service mission to Ghana will be the richest part of her University experience. Doesn't it make you wonder why we would want children to spend so much time in classrooms while there is a whole-wide-real world from which to learn best? My daughter and I also had an interesting discussion about "making gone wrong." 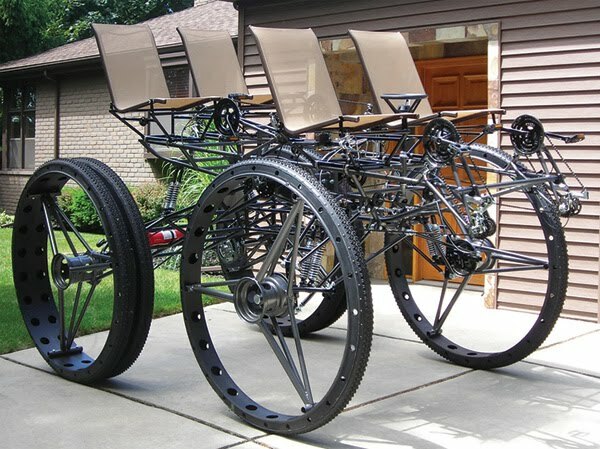 There is a website you might enjoy called Regretsy.com reminding us that when human beings are suddenly inspired to make things, those things can turn out to be crap. I admit to being a snob, believing that things should be made with skill and be useful at the least, and beautiful if possible. Regretsy.com borrows crafted or vintage items from etsy.com to feature on their website. 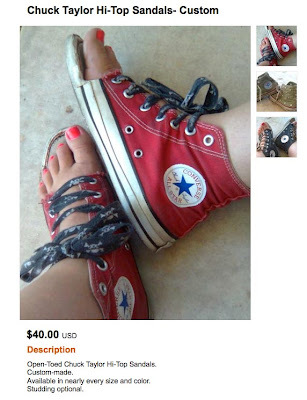 The shoes shown in the photo above are just one example. It is in the nature of writing a blog that in the course of months, I have the opportunity to write on a number of topics, enhancing my own understanding, and I could hardly find a richer subject for exploration than the hands. You may find Heidegger to be interesting reading regarding the wisdom of the hands. The following is out on a limb, brain storming, responding to conversations and readings and should be considered speculative dialog which you are welcome to join. While a person may be either left or right handed, there are many activities in which the left and right hand work together. Carving offers one example. In chip carving, the right hand may hold and direct the motions of the knife while the left hand steadies the right. In some forms of carving, the right hand may hold the knife, while the left holds the wood. In either case, effective skilled use requires partnership between the hands. We think of course that the hand holding the knife is the important one, and we are described as left or right handed based on the ease with which one side or the other holds the tool, ignoring the essential relationship between the two. There are similar things going on the the brain, with two distinct forms of attention associated with the left and right hemispheres. The left brain brings attention to specifics, while the right brain attention is focused on security and wholeness within surroundings, thus steadying and supporting the activities of the left. 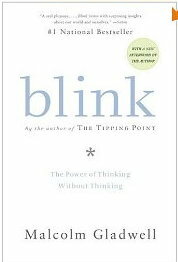 Some of my readers may have read Malcolm Gladwell's book, Blink, The Power of Thinking Without Thinking, describing gut-level, instantaneous reactions to things that proved to be right. Gladwell described a piece of artwork, and a museum curator's inexplicable gut-level sense that it was a forgery. His sense contrasted strongly with available evidence, and the rational conclusions reached by others with equal credentials. While the left brain would be looking for and examining specific details, the right brain would be looking for the overall fit, the relationship of the object to the big picture, examining things that may lie outside the realm of reasonable discourse. Because of the dominance of the left brain, and the inability of the right brain to formulate the dialog for discursive analysis, it's argument of last resort may be made on the level of defensive hormones released in the body and affecting "the gut". Last week I described the ways left and right bird brains have specific areas of attention, with the left focusing on feeding, being able to select seed from a field of sand, while the right maintains surveillance on the overall environment. The right brain's attention would require rapid engagement of the "flight or fight" mechanism that engages the neuro-hormones involved in self-defense. Can you see how, when the right brain demands our attention and has difficulty quieting left brain chatter long enough to do so, it's only response will be through strong feelings in the gut as the body prepares for either fight or flight? You may also see the gut-level response as kids make their end-of-the-day escape from institutions of learning. Have you ever sat at a desk while feeling the impulse to flee, or even fight? Even those of us having passed through education relatively unscathed may have experienced it. In schools we need to pay attention to the needs of both the left and right brain, the one that can be addressed through discourse and logic, and the one that is beyond discourse. And so, what happens when we bring both the left and right hands into education? Do the hands offer the means through which to strategically engage both hemispheres of the brain in equal measure? At the moment, there seem to be only a few of us talking about it. But there do seem to be thousands of students fleeing education. Perhaps they are voting with their feet because we have failed to engage their hands. Which shall it be, fight or flight, or make beautiful and useful objects? One thing you will notice about the left and right brains is that the left brain has greater facility for language, while the right brain, unless it has the cooperation of the left brain in formulating thought into shared language remains mute. That means we are often arriving at conclusions that we cannot express in common school form, unless within that school we are given the opportunities of music, physical education and the arts. And in your gut, I suspect you know I am right. You can see that the door panels are now fitted for the fronts of my small cabinets. Next comes routing, sanding and assembly. In the foreground you can see the contrasting wood doors for the hickory and walnut variation. I resawed and book matched the panels to add interest. In the photo below, you can see the 4 small cabinets offered as variations on a theme, with the aforementioned steps complete but for final sanding. They offer four kinds of corner joints, 4 basic woods, with one having contrasting door panels. 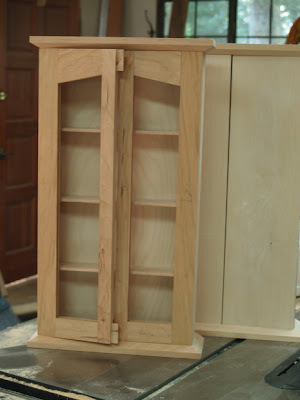 One cabinet offers solid wood doors, and I made the cabinets in two sizes. •Identify the practices, systems, and policies needed to support these next generation programs. •Identify and discuss changes in mindsets, policies, and practices required to make these designs a reality. 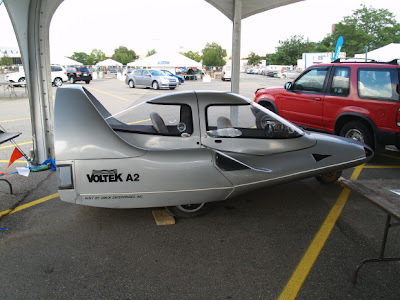 I will be going camera in hand to capture the excitement at the Maker Faire. You can sit yourself to an earlier death. Sitting, even after workout, can cut lifespan No danger of that happening here, but many people sit for a large proportion of each day and pay a severe price for it. "Prolonged time sitting suppresses your immune system, which may increase the risk of cancer and other diseases. And your blood isn’t circulating as it should when you’re sedentary for long periods of time. When blood doesn’t flow through your veins up to your heart, it could lead to dangerous blood clots. It also has metabolic consequences – increasing your resting blood pressure and cholesterol levels. Researchers say the metabolic effect may explain why the association was strongest for cardiovascular disease mortality in the study." "Essentially, those who sit less, live a longer life than those who don't." 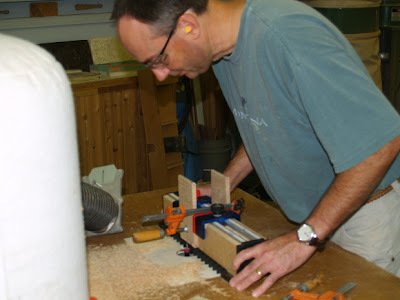 It seems that the dangers of dying from sitting add one more layer of argument against TV and one more reason to spend evenings in the wood shop. Women who spend up to six hours a day sitting are 40% more likely to die sooner than women who spend less than 3 hours a day sitting. So women too, can benefit from more time in the wood shop. And if you are living longer, guess how much more work you can get done than by those who've sat themselves into early graves? Lots and lots. 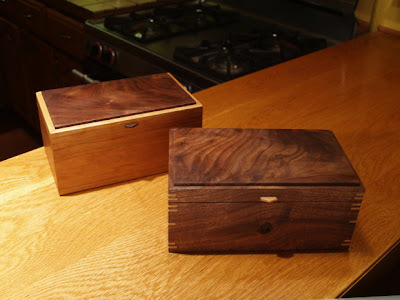 Speaking of wood shop, I finally got around to applying the first coat of Danish oil finish to the boxes I made as demos at Marc Adams School of Woodworking. 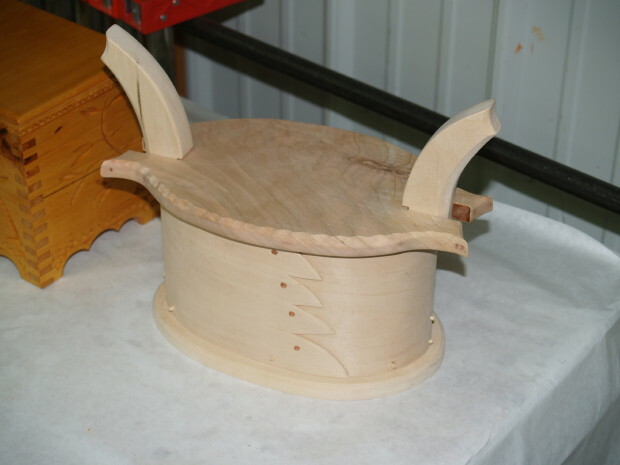 These as you can see in the photos above and below are made of walnut, cherry and maple, and the lid support straps are of my latest design. I hope all my students have also finished their boxes by now, and are as pleased. There is a tremendous satisfaction in making things, and seeing them come to exist on their own as finished forms. And it is better than sitting around doing nothing and dying from it. Here you can see two variations of my small spice cabinet. 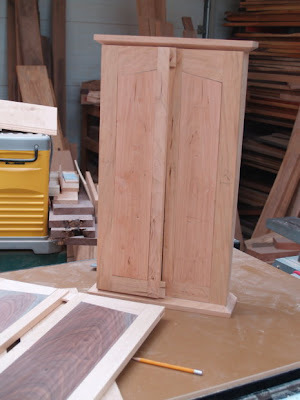 The foreground is cherry with a raised panel door, and in the background, basswood with solid wood doors. You can see that I'm making progress. Woodworking is both interesting and fun. It makes you smarter and at the end of the day, you have something tangible to show for your efforts. I will be at the Detroit Maker Faire on Saturday July 31 as part of my participation in a hands-on learning conference. 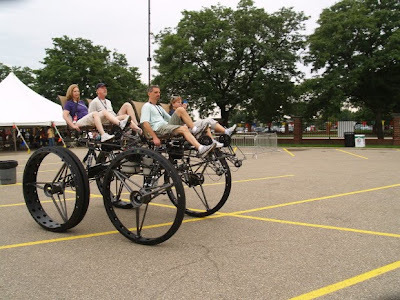 The photo above is of a project by Maker Faire participant Tom Wilson. The key to economic renewal in the US is for us to begin making things again, so being in Detroit, which has suffered from our failure to comprehend the relationship between creativity and human culture will be a great thing. Yesterday was the last session of Pee Wee Science for this summer at our Carnegie Public Library. The children, ages 3-6 made mobiles representing the water cycle. For most children, this was a first. Kids don't make things in their homes anymore. Mothers are involved with personal electronic devices, keeping up with friends on facebook. Dads are busy gaming in their spare time instead of tinkering with stuff. Making is the foundation of scientific exploration and provides the starting point for engagement in science education. By making, we learn the qualities inherent in the structure of life. Without making, we become a nation of idiot consumers, and it is a matter quite easy to fix. Buy some craft supplies and get busy. Paper and Scissors won't push you over budget, and will pay dividends beyond measure. If you can afford it, buy string. It can add endless hours of fun. If you are old enough to be trusted with a knife, find a stick and whittle up some wood chips. It might lead to something you would never expect. Makers Faires are celebrations of our impulse to fix and make and are associated with Make Magazine.As you can see the photo below, I am catching up from yesterday's faulty memory card, and am relieved that the problem was not with the camera. 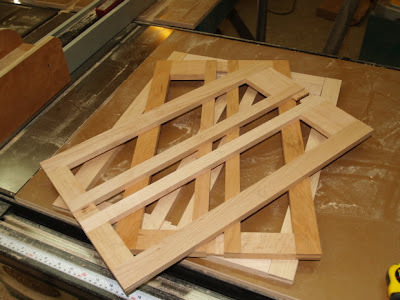 I now have the step-by-step photography completed for making doors using bridle joints. I spent most of the day in the wood shop making the door frames shown in the photo above, but learned a while ago that I had a memory card failure, and none of the step-by-step photos can be saved. that means I have to recreate a day's work in the wood shop. I used a program called Photorescue to try to salvage the shots, but it seems they were damaged during the shoot and there was nothing to save from the disk. Technology is wonderful when it works. It would be nice if it had given some warning. 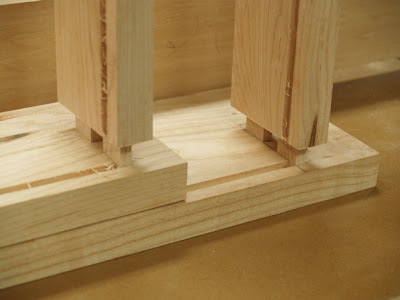 The joinery used in making the doors is the common bridle joint. 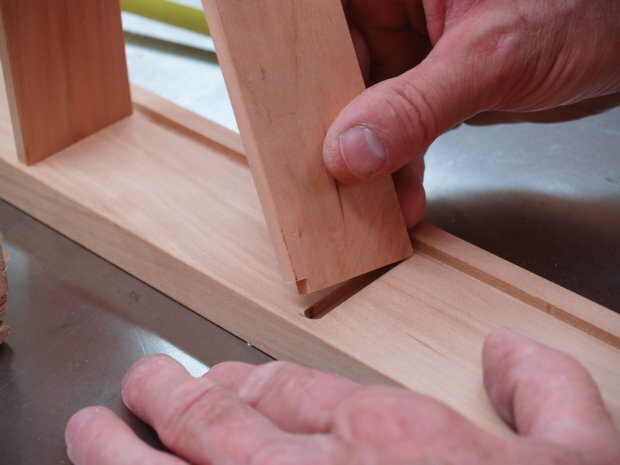 It is a reasonably simple means of making small doors, requiring no biscuits or dowels and providing a great deal of strength. The top and bottom rails are long to allow the tenons to be trimmed off after the doors are glued. 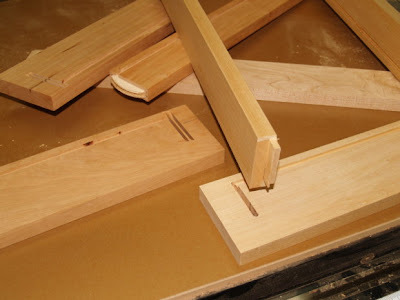 The top rails are deliberately wide to allow them to be shaped before assembly. In the photo below, you can see the hickory cabinet with doweled joints and bridle jointed doors assembled and nearly complete. I'll make walnut panels for the doors tomorrow. Today I have been fitting the parts of the small spice cabinets, routing edges and doing final sanding before assembly. As you can see in the photo above the through mortise and tenon joint cabinet is ready for glue and wedges. In the meantime, not much to say about the hands. It is so pleasant just to have them in use. 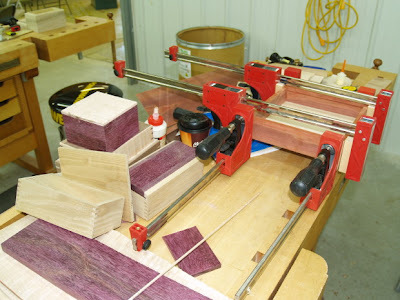 I now have the wedged tenoned cabinet assembled and you can see the wedges being driven into place in the photo below. Tomorrow I assemble the remaining cabinets and begin making doors. 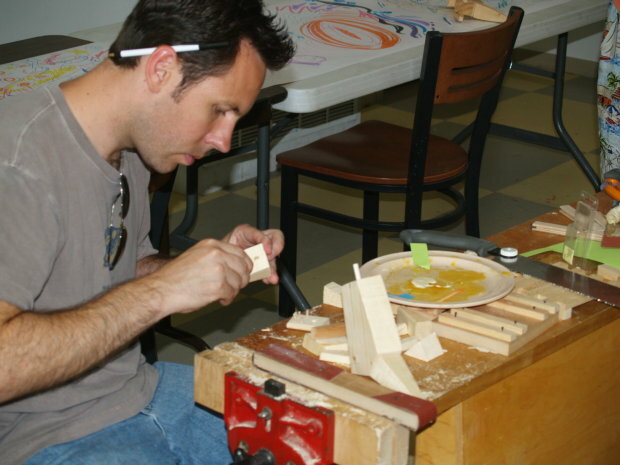 Asa Christiana, editor at Fine Woodworking asked Do Woodworkers Need the Furniture Society? in a recent FWW blog post, reflecting on his attendance a few weeks back. Due to declining membership and participation, he wonders if the organization is necessary in the first place. Many of the members may be wondering the same thing, but I see vast potential if the Society chooses to make a renewed and enhanced public service commitment to woodworking education. 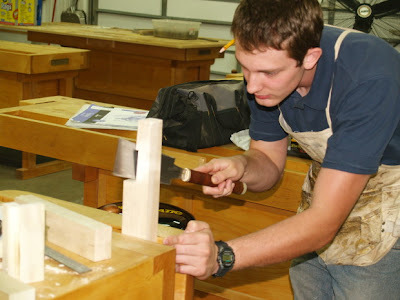 In the 60’s, I would have taken woodshop, but the choice was college prep or the trades, and never the twain would meet. You would be one or the other, not both, despite the recognition of early manual arts advocates, that working in school wood shop brings intellectual and academic advancement. 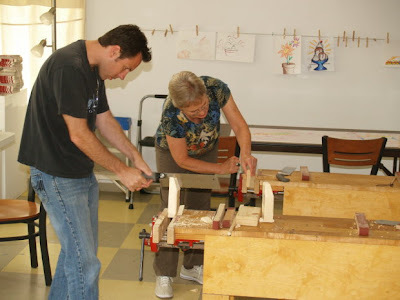 Hands-on learning in schools would be the cause I hope the Furniture Society and others promote. One thing I would like to share with members of the Furniture Society and other readers is that building a market for ones work is a process of education. 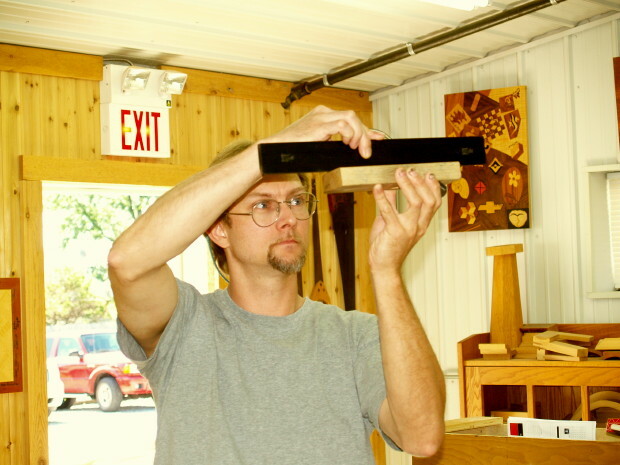 If we don’t have an ongoing process of building knowledge in woodworking, about woodworking, in schools and out, we are allowing the market for our work to shrivel and die. I can tell you as a long time professional, that the customers who have bought my work and sustained my ability to continue growing in my field have been people trained and experienced in the arts, and if that is truly the case for others as well, then the teach-to-the-test, no-child-left-behind philosophy of American education presents disaster for the field. Without experience in making things and knowing the value of skilled craft, the American marketplace will be a very sorry place for anyone to attempt to sell fine workmanship. So I can see where self-interest in success would push furniture makers toward collective effort in education. If we use the society to share knowledge and skill, some pretty fine things could come from it. Today, I have been working on various details for the small spice cabinets, cutting backs to size, fitting shelves. 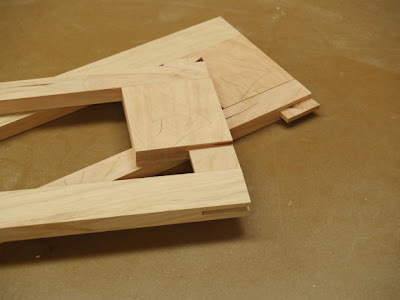 You can see the simple jig used to guide the plunge router for fitting the shelves in the photo above. 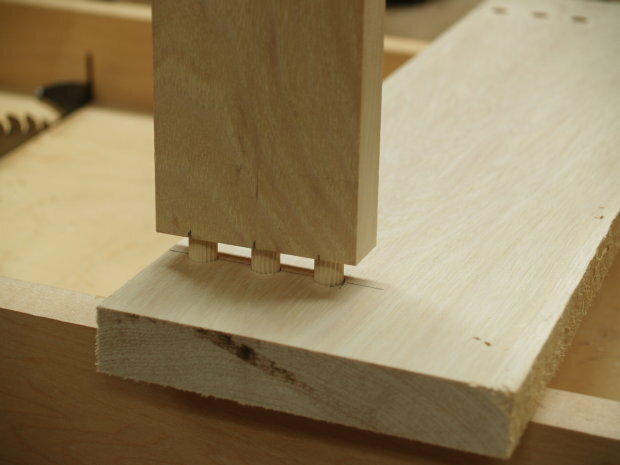 Taking a small cut from the front edge of each self allows for them to fit without the groove in the cabinet sides being visible, as shown below. The doweled joint was one of James Krenov's favorites for his small cabinets, and unless you have a horizontal borer like the ShopSmith, the next best way is using a common doweling jig. This is one I've used for over 30 years. The next step shown below is done on the drill press to make sure that the holes are drilled vertical and that I don't drill through to the other side of the stock. The fence on the drill press is used to assure alignment for each hole. If I were doing a number of cabinets of the same size with the same technique, I would use stop blocks on the drill press fence so the operation would require less attention. Very accurate drilling is required. Any simple thing can be done in a variety of ways, so there is no shortage of opportunity for making things different, in a personal style and in a manner comfortable to your own working conditions. I am working on a new book about making small cabinets and the photo above shows two types of joint that do exactly the same thing. 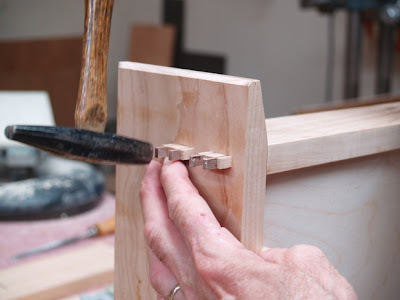 One is done using a biscuit joiner and the other, a blind mortise and tenon joint, is formed using table saw and router table. Each is equally effective. I am currently adding a third joint to the mix, a through wedged joint. 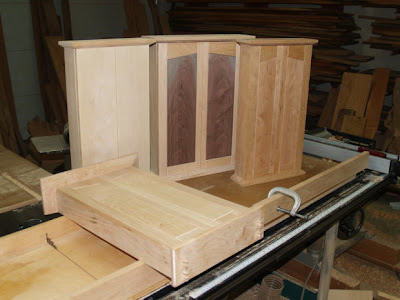 The woods used here in making small spice cabinets are cherry and basswood, and the woods themselves offer new options for personal expression. 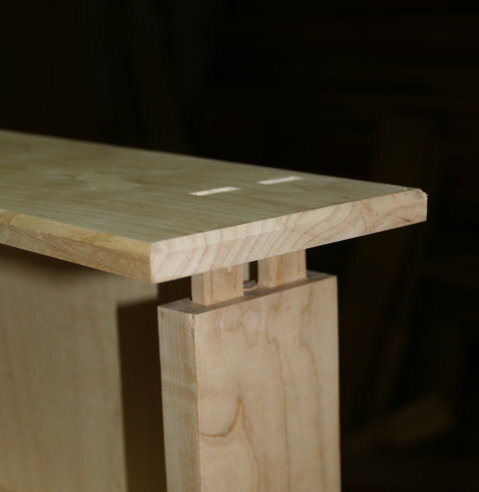 A third type of cabinet joint is shown below, an exposed mortise and tenon, which will be locked in place with walnut wedges in the finished cabinet. I will also do a doweled joint on another cabinet, using this first chapter to set an example for what readers can do with the rest of the book. Of course I could be mistaken about Dr. Harrell's intent, but one rarely gets a second chance to make a first impression. Laying one's cards on the table makes a better start. Many people are concerned about school behavior, and many of those who represent various religions have presented the hypothesis that prayer in schools, classes on the Bible, prominent display of the Ten Commandments and other trappings of specific Christian faiths would correct the behavior and attitudes often seen in schools. The idea of course, is that public schools should more closely resemble Sunday School, and if that's the case, don't expect attendance to increase. Me, as a teen? I'd have been out of there and quick. One interesting thing that we discovered in our class, "Brain, hands and the arts" is that the engagement of the right side of the brain connects us in more meaningful ways with each other, and that connection is the foundation of moral values and character education. Can it be that we can create schools in which children care more for each other, are more cooperative with teaching staff and administration, see more clearly educational goals for themselves, and truly become lifelong learners? It can be a simple thing. Engage both halves of the brain, commandeer both parts of each student's attention, through the strategic implementation of the hands. Tim Jackson at TED: "We spend money we don't have on things we don't need to create impressions that won't last on people we don't care about." Then at some point, we have to dispose of the crap we didn't really want in the first place. That costs, too, and the burden on the environment is enormous. Tim Jackson is an economist and the author of Prosperity without Growth. 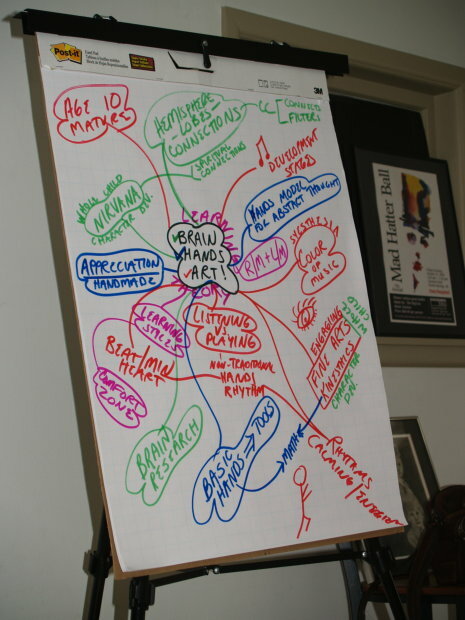 brain, hands and the arts! Today we concluded our brain, hands and the arts class at ESSA with the mind map at left, briefly summarizing and reflecting upon the range of materials we covered in the class. In the photo below, you can see one student's work (not including two days of art and music). This has also been a mr.fix-it-day for me. I removed and replaced the heat-pump/AC unit in my office which had quit the week before I left for Marc Adams School. The new unit was narrower and taller, which meant adjusting the through-the-wall opening to fit... the project made me thankful for my carpentry/woodworking skills. 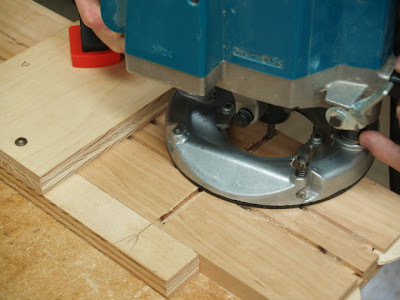 I was able to use a trim router to make the opening taller, and planed wood to fill the too-wide space to fit, while many other homeowners would be trying to find a skilled handyman and waiting for him to arrive. When I was out of town last week, our oven quit and would no longer ignite. It was a problem I have come to recognize from past experiences as being due to a faulty igniter. I ordered the part, and spent a half hour replacing it and saved well over $100, without having to schedule a service call. I did it easily on my own schedule without waiting for help to arrive. But that's just the half of it. The satisfaction one feels from real accomplishment is more important than the money, hands down. "There is nothing wrong with accountability. The question is, accountability in what? None of these state exams measure progress in love of learning, they do not measure progress in imagination or artistic achievement, not progress in music, not progress in increased scientific curiosity, not progress in an increased commitment to human rights, or in confidence gained, or in stories written. None of that is sufficiently easy to measure." And these important formative experiences are thus ignored in our obsession to measure results. Through "no child be left behind" we have left all children in the lurch. By centering education on the measurable, we have abandoned the immeasurable values that are offered by the arts. There are lots of ways to describe the needed change in education. One is "experiential learning," that if children learn by experience, their hands-on engagement, intellectual curiosity and emotional enthusiasm are assured. I have a simple way to make certain that the school improvement can be monitored. Look for and plan for the strategic implementation of children's hands. Simultaneous attention is possible with the two hemispheres of the human brain, which is not a matter of schizophrenia, but the natural result of the divided brain, capable of paying attention to both fine detail and to broad involvement. Years ago, I spent nearly every Sunday afternoon driving to Springdale, Arkansas to participate in a meditation group, and the group leader described "dual awareness" though which one could simultaneously attend to matters close at hand, and broader notions of one's "spiritual" connection. When Jill Bolte Taylor described right brain "nirvana" in her TED talk, she was describing the consequences of being engaged in that part of herself that exists without boundaries. Is there some major gulf between what neuro-scientists are describing here in two forms of attention, and what my meditation teacher friend described as "dual awareness"? Can it be that the dual awareness state created by meditation is a state natural to all humans and animals when we escape the undue dominance of the left brain? What happens in schools in which teachers make a deliberate effort to engage both left and right hemispheres of the brain of each child, and their own. It is all a bit too spooky, spiritual to expect to see it happen widely in schools, and yet... With the right subversive attitude, it will. What would happen if all teachers realized that instead of teaching 18 students at a time, they were teaching 36 different brains with 36 divergent attentions? Perhaps school boards, administrators and communities achieving such insight would reduce classes to a more reasonable size. Tomorrow the ESSA "brain, hands and the arts" students will be creating lesson plans to deliberately engage left and right brains through the strategic implementation of the hands. Today my ESSA students made planed shavings as evidence of learning, they made sloyd trivets, t-rex dinosaurs, and toy cars using their own imaginations. Photos at top and below. I have been reading Master and His Emissary by Iain McGilchrist, and he illustrates the necessity of the divided brain through exploring its role in other species. It allows for two essential, distinct, and simultaneous forms of attention. Remember that the left brain is connected to the right eye, and right connected to the left. Many types of bird show more alarm behavior when viewing a predator with the left eye (right hemisphere), are better at detecting predators with the left eye, and will choose to examine predators with their left eye, to the extent that if they have detected a predator with their right eye, they will actually turn their head so as to examine it further with the left. The left brain, and right eye, in contrast, performs another task, that of isolating and finding food from within its field of vision. This task is extremely sophisticated, as the bird attempts to visually isolate a small grain of seed from a field of sand and non-edible materials. The matters of finding food, and of maintaining a sense of security within the environment are two extremely important functions requiring two distinctive, and different forms of attention. The two halves of the brain are connected by the corpus callosum, but the function of the cells within it serve both to connect, and actively isolate the two halves of the brain from each other, allowing each to maintain its own necessary distinctive and separate form of attention. To vastly oversimplify things, in the human being, the left side of the brain, that in more primitive animal life would have been deciding what to eat, has been allocated the tasks of reading and language, because it is best of the two halves equipped by evolution for that function. The right brain, still, as it has always done, maintains a sense of the security of the individual within the larger environment. Something we are doing in schools is obviously not working, because children are deciding they don't fit. We can see it in the statistics, the drop out and failure rates. And so, the left and right hands, mirroring the right and left brains, as outward extensions of innermost structure, offer a point of leverage for us to make change. Make certain the hands are engaged in learning. The brain (and all of it) will follow. The hands offer a means through which to make the brain whole and wholly involved in learning. I call it the strategic implementation of the hands. I will have more on the two types of attention later in the day. In our class at ESSA, "Brain, hands and the arts," we reviewed educational sloyd as a teaching method, and then got down to the fun part, whittling reading sticks, making paper sloyd models and then making owls inspired by the book Hoots and Toots and Hairy Brutes, concerning the adventures of a small owl named "Squib". That and a bit of interesting discussion filled our day. Tomorrow we will have more of the same, but the woodworking gets even more fun as our skills grow. Evidence of learning from paper sloyd is shown above, making owls below. 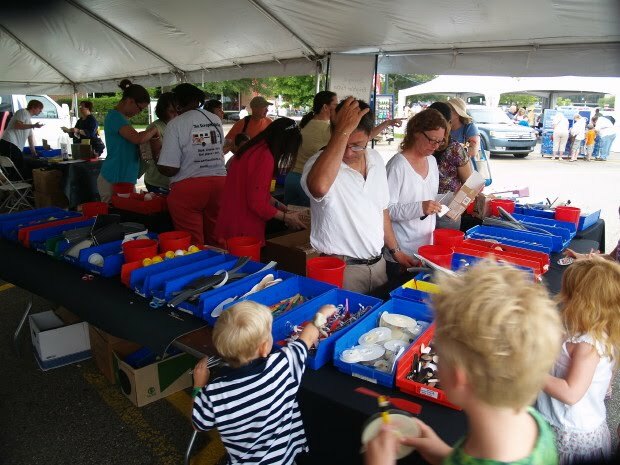 I have been invited to a hands in learning conference in Dearborn, MI on Friday and Saturday, July 30-31 where I will meet with a number of other hands-on learning enthusiasts. Would it be proper to say that when it comes to the hands, change is afoot? Today at ESSA, my teaching partner, Dr. Peggy Kjelgaard in our class, the Brain, the Hands, and the Arts is working with the students on music and drawing. 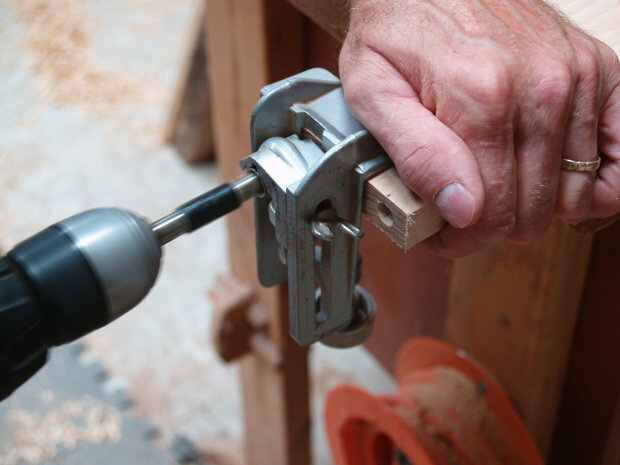 On Wednesday and Thursday, we'll do woodworking and talk about Sloyd. Brain research is all abuzz these days. It is very exciting to examine this powerful mass of squishy flesh with the high tech imaging tools that have begun to allow scientists to make sense of it this late in human development. The hand, on the other hand, is a bit more straight forward in its structure. You can cut it open and literally see how it works. Ligaments and bones and muscle are connected in ways that can be observed and understood. But the modern concept of distributed intelligence informs us that the hand itself, as simple as it may appear to be, is deeply connected to the structures within that good old squishy brain we are just beginning to understand. Man alone has a hand. He uses it as a tool, as a symbol, and as a weapon. A whole literature of legend, folklore, superstition, and myth has been built up around the human hand. As an organ of performance it serves as eyes for the blind, the mute talk with it, and it has become a symbol of salutation, supplication, and condemnation. The hand has played a part in the creative life of every known society,and it has come to be symbolic or representative of the whole person in art, in drama, and in the dance. My point is that you really can't get the brain (or man for that matter) without grasping the hand's role in shaping its (his) development. And unless our children are to become radically unhuman, their lives and educations are ill-served by neglecting to engage their hands. You can read Ethel Alpenfel's article by downloading the pdf file Here. As Frank Wilson proposed in his book, the Hand, How its use shapes the brain, language, and human culture, the hand and brain co-evolved as a behavioral system. You can't come to terms and know one without knowing the other. This same co-evolution is reflected in the growth of each of us... leaving our brains with less creative potential if the hands are ignored. In the meantime, an article by Ann Bibby, American Children Growing Less Creative suggests that children may be getting measurably smarter and much less creative. The solutions Bibby proposes are that school learning become project based, avoiding the kinds of memorization that the teach-to-the-test methodology commonly entails, and that parents limit passive home entertainment and take a more questioning and engaging role in helping their children become problem solvers. Bibby also notes that challenges and challenging circumstances promote creativity... by making things easy for our kids, we limit their creative potential. The king of all creativity makers is still play. Children who can entertain themselves, and who make up games or create alternate fantasy worlds, tend to score highest on creativity tests even as they get older. The child who would rather play with the box, instead of the toy that came in the box, is likely the future inventor or author or Nobel scientist. Amen, sister, you're preaching to the choir. As the son of a Kindergarten teacher, I was always amazed by how my mother would know all her children by name within the first two days of school. Imagine having 25-30 children in the morning and and another equal number in the afternoon class, and then having all the names memorized and connected with each face before the end of day 2! In comparison, when I teach at Marc Adams School of woodworking, I struggle to know the names of my 18 students by the end of the week. Today, one of my students at ESSA, a third grade teacher, explained her method to learn all her students names so quickly. Her explanation provided insight into how my mother did it, too. By the time the child's name is written by the teacher on so many things, lockers, cubbies, name tags on desks, file folders, lesson plans, and more before the first day of school arrives, the name is strongly locked in memory and then when the face is added at the moment of first introduction, the lasting connection is made. This explains a great deal about how we learn. It fits the idea of use it or lose it. It also affirms the value of repetition and preparation. We learn best and most efficiently when we have clear purpose and method for learning. What often seems magic, or an example of exceptional intelligence may only boil down to method, diligently applied, and I tell this not to diminish my mother's accomplishments, but to give clearer direction to our own. At Marc Adams school, in contrast, the student's names are engraved on wooden plaques that are affixed to each workbench and taken home as a souvenir at the end of class. It is a nice touch for the student, but not the best technique to facilitate the teacher knowing student names. I am only able to connect student faces with their names when I am standing at their bench, or through a great deal of effort to use each student's name during the days of the class. So you can see that I have my work cut out for me. First a word of warning. It is very easy to oversimplify the workings of the brain and many of the early generalizations about the left and right sides of the brain are oversimplifications. Still, one of the ways the two sides of the brain differ is that the left side tends to work serially, in order and sequence and for children being in school, being there, present, everyday is important to keeping within the sequence in which curriculum is offered. If a child skips a day, to return to the pattern of learning is an additional challenge. For instance, try to read a pattern of text with key paragraphs removed, then try to find meaning in it. The right side of the brain takes a larger view. Jill Bolte Taylor, author of My Stroke of Insight, using a computer analogy for examining the way the brain works, describes the left side as a serial processor, the right a parallel processor. 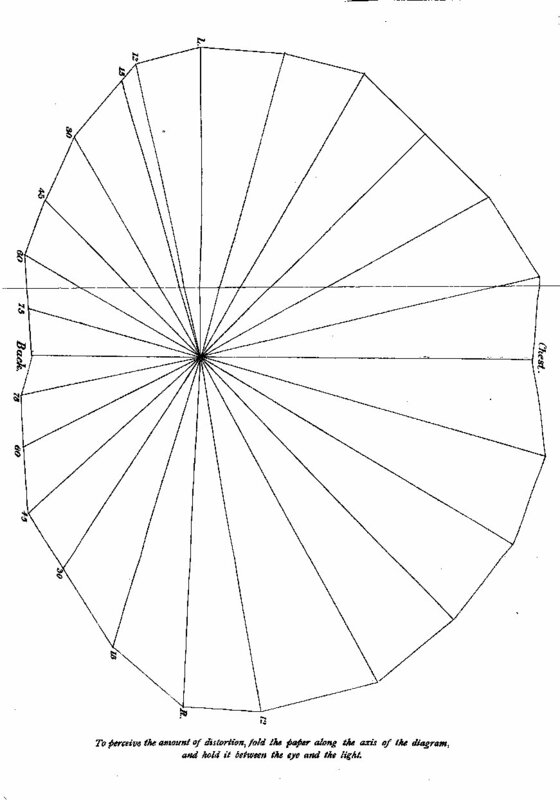 The right side looks for larger patterns, creating a sense of the whole from what it perceives. It's engagement is therefore necessary for the child to find a place of comfort within education. The right side of the brain alone can contend with the creation and use of metaphor through which the mind can use one thing to understand another. The ability to use metaphor is the foundation of creative problem solving and creative leaps of intuition. If you want a system of education that is dead to exploration and fails a large proportion of students of all levels of capability, keep things exactly as they are now. If you want something better, then make learning more friendly to the right brain. The strategic engagement of the hands is the key, and over the next few days, as I am involved in the class at ESSA, I'll be attempting to explain why. 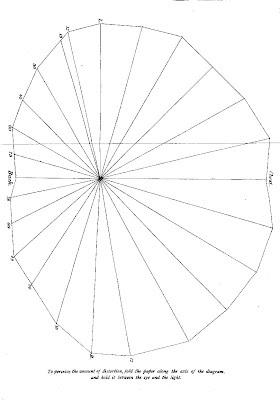 The image above at left is from Otto Salomon's Theory of Educational Sloyd, and if you print out the image and then fold it at the center-line running between back and chest, you see that human beings tend to be asymmetrical. The brain, too, is asymmetrical, with each side being engaged differently in processing information. They are measurably asymmetrical, in shape, mass and volume. Early Manual arts advocates suggested that children became "one-sided" when their brains were engaged without corresponding physical engagement in making and manipulating objects. At one time, Otto Salomon experimented by asking students to use both hands equally in educational sloyd, but the idea was later abandoned when he realized that the tendency toward either left or right handedness, was too strong an impulse to change. And yet, because the left and right hands function in direct response to impulses from the right and left sides of the brain, the use of hands in learning does engage both hemispheres, and the purposeful engagement of the hands can bring both sides of the brain into play. This week at ESSA, school director Peggy Kjelgaard, Ph.D. and I will be teaching a class on the Brain, Hands and the Arts. I will have much more to share during the course of the week. The radio program Human Kind presented a audio biography of Helen Keller this morning on NPR, an introductory excerpt can be found here, Or the full one hour program can be ordered as an MP3 file or audio CD through this site. The most amazing thing in the Helen Keller story beyond her courage, faith and service was the role of her hands in allowing her to emerge from blindness, deafness and isolation. On another subject, the era of "cheap" made-in-China consumer goods may be coming to an end, leaving global traders looking for new suppliers of the cheap labor required to produce their goods. What if we were to bring the work back home and demand that the objects we buy be objects of useful beauty, reflective of personal growth and environmental responsibility within community? All too often, the perceived value of an object is based on market demand rather than on the qualities the making of it offers the maker. The photo above is an example of my mother's craft work from when she was a teen. The quality of her work was not at the level of work done by her mother or grandmother, but as stated by Otto Salomon, the value of the student's work is not in the work, but in the student. To make such an object imparts qualities to the maker... a fact neglected in modern American education. The making of such objects is part of the process of development of character and intelligence, and as we have become a nation of consumers rather than makers, we have grown more and more out of touch. 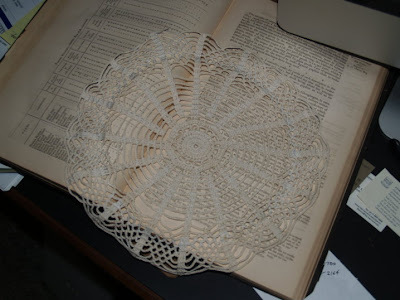 The piece shown above is an example of a needlework technique called crochet. Another form for making lace patterns is tatting. 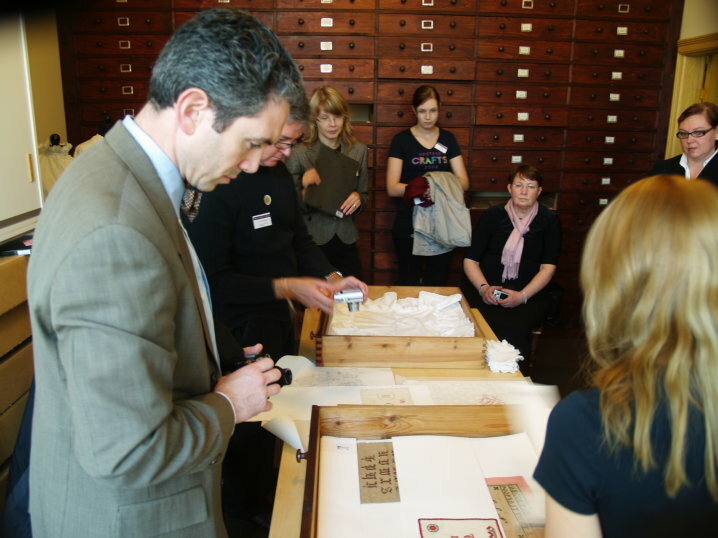 Both were part of the compulsory school curriculum for women in Finland, and as shown in the photo below, the University of Helsinki still has a room dedicated to their collection of student work which I visited in 2008. Each drawer on the wall in the background is filled with amazing works of craftsmanship, the intellectual content of each piece leaving the viewer in awe. Many of my readers of a certain age might have been required to read George Elliot's Silas Marner: The Weaver of Raveloe while in High School. Today, I am reading a book given me by my librarian friend at Teachers College, Reports from Assistant Hand-Loom Weavers' Commissioners, ordered by the House of Commons, 4 February 1840. The quality of this copy is such that it would hardly stand much more than a few more readings. No doubt there are other copies of this book available in the UK. This is actually the oldest book on industrial arts in my small library. It calls to mind, the character Silas Marner, in that it offers great insight into working conditions, and traits of character among real hand-weavers of the same period. The books, Silas Marner, and this one I am reading now, courtesy, Teachers College disposal of old library books and the generosity of a friend, offer important insight into the transitional period at the beginnings of widespread industrialization, and the beginnings of the end of widespread acceptance of the value of common crafts. The image above is of Silas Marner, hand-weaver and his adopted daughter Eppie. The report covers a variety of issues from various hand-weaving regions of England and Ireland. It investigates the impact of child labor, the effects of additional new technologies, the rise and fall of market for the product and its effects on the earnings of workers, most of whom worked 70-75 hour weeks at the loom for declining wages. The report also inquires into the morality of workers, particularly with regard to temperance and embezzlement... finding the weavers by and large to be honest, sober, moral in their dealings, and concerned with the lives of their children. I am interested in this report on the hand-weavers because I would like to encourage a society in which skilled expressions of the human hand are regarded with greater respect and where the value of hands to development of character and intellect are better known. One of the types of weaving described was that of "stuff weaver" and the investigation of that led to this interesting list of early and largely forgotten occupations. The earliest recorded use of the word stuff referred to the quilted material worn under chain mail, with the word stuff gradually expanding through centuries in meaning, (as stuff does, stuffing) to fill our lives and encompass a wider range of things. There is a difference between what we have come to call "stuff" and meaningful objects. Stuff is a word we use with a sense of disdain. Having returned from Nebraska with a U-Haul trailer loaded with some of my mother's personal effects, and having rented a storage unit to help us sort and process the things that are most meaningful to us, the idea of "stuff" becomes an interesting point for personal reflection. My mother had a lot of stuff. Her closets and drawers were full of materials for making table ornaments and decorating bulletin boards for church and the clubs to which she belonged. My sisters and I hauled truckloads of stuff to the church for their annual sale, and we disposed of many bags of stuff with little or no value at curbside pickup. George Carlin offers his observations on the matter, and then there is the "Story of Stuff", which describes the hidden environmental costs of making and using objects. By making things are we making "stuff?" Or can we make things of useful beauty that fit better with the environment and enrich our personal lives and provide greater meaning to all? I have been putting away my sample boxes and getting ready to apply finish to the boxes I made at Marc Adams School of Woodworking for demonstrations in my box making classes. Objects can have value in teaching, and the making of them may serve in personal growth. Sometimes objects represent relationships with deep meaning, and we may cling to those objects as evidence of that relationship. And when an object is devised to represent greater meaning, and serves as evidence of learning, do we still call it "stuff," or is there a better term that might apply? I invite your response in the comments below. The survey explores the risks involved in woodworking programs. For a discussion of the benefits, readers might enjoy this document, 21 Reasons for School Wood Shops that I helped write for the New England Association of Woodworking Teachers. I am now preparing for a class next week at ESSA on the brain, hands and the arts. 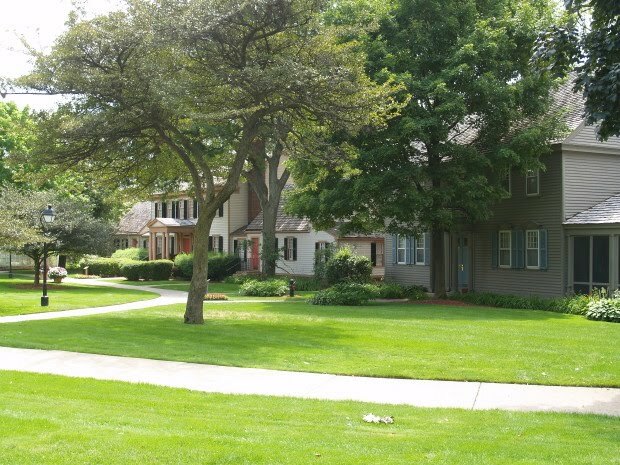 I don't know if any of my readers have been missing me, but I was away for nearly two weeks, first at Marc Adams School and then in Omaha, Nebraska, helping to clear my mother's house to be put on the market. It is absolutely amazing how many small objects a person can accumulate in a lifetime, and when over 40 years are lived in a house, and 4 children had been raised there, the personal effects can be overwhelming. Many of the objects were things my sisters and I had made in art classes, and my mother, too, had been an accomplished artist and writer of children's books, so closets and drawers were heavily laden with supplies. We spent days going through letters, even finding some from her kindergarten teacher days that revealed the admiration felt for her by the school staff, parents and students. Evidently, getting rid of personal effects following a death in the family is a challenge that many people face, and there are companies that will come in and do it for you, recycling all your stuff through auctions, sales and the city dump. They might turn your parents' estate into useful cash. Or not. In American plains Indian tribes, families would give away all personal possessions at the time of death, distributing any valuables among friends. And that would not be a bad idea for us. Objects are both blessing and curse. Our landfills are filled with useless, broken or meaningless stuff for which we may owe the Chinese for generations to come. And so, what is the real value of stuff? It is clearly not in the having but in the giving and making. When you give something, you express something important of yourself, generosity. When you make something, you take part in the development of skill, arising to a higher level of character, confidence, capability and intellect. Last night I was invited to make a presentation to the Omaha Woodworker's Guild during their monthly meeting in South Omaha, and two members brought segmented turnings for show and tell. Objects of the kind they displayed are obvious in their intellectual content, and it is of vital importance that schools, parents and children begin to understand the value of object-based expression of intellect. The true value of objects is that of fostering educational enthusiasm and the expression of intellect. Make it and sell it or give it away, thus making room for renewed growth. 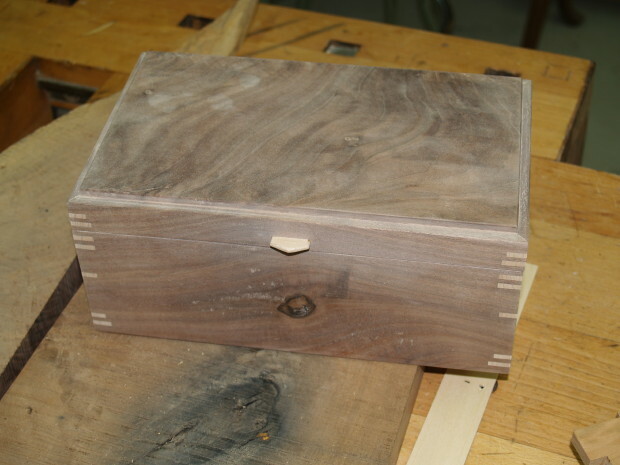 Today we finished our last day of box making class with demonstrations making inlay and wooden hinges. There are no limits to the possibilities when it comes to box making, but I think we were worn out. 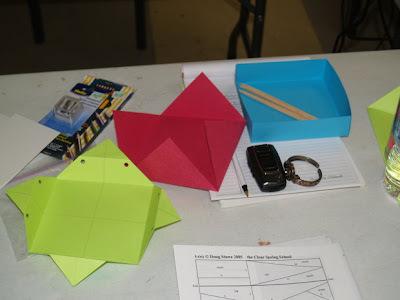 Marc Adams noted that perhaps in the future we should call it "boxes making class" as each student had made several rather than one. 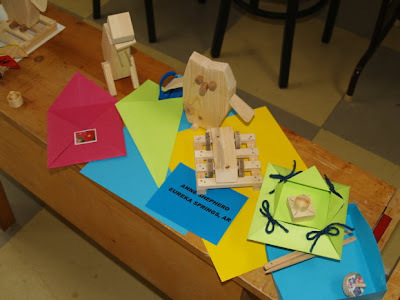 Students took home samples of a variety of styles and joinery techniques. My first, second and third grade students at Clear Spring School love having what they call a "creative day" when they get to do whatever woodworking they want. 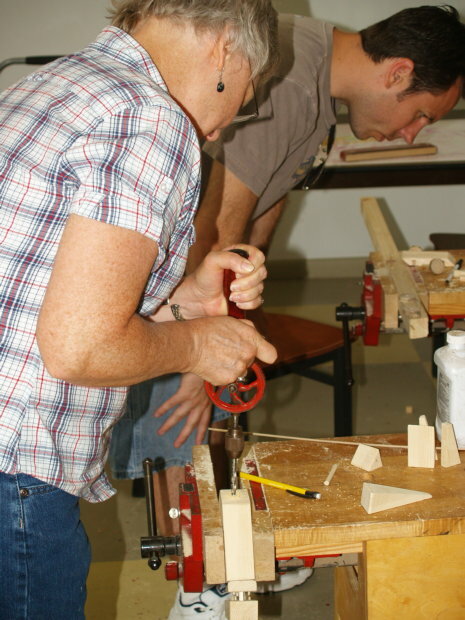 Box making class at Marc Adams is like a "creative week" for adults. And in taking a walk through the benchroom, one sees the results. This year my class was sold out with a waiting list, so if you are interested in taking this class next year, register as soon as possible in December to assure your place in next summer's class. I want to publicly thank my assistants, Marc Adams School staff members Doug Dale, Zane Powell and Herman Bueno. They are essential to the success of the class, making certain students are safe and that their creative inclinations are fulfilled. I am on the road for the 4th of July weekend to visit with my sisters in Omaha Nebraska and will meet with an Omaha Woodworker's Club on Tuesday night before returning to Arkansas. My demonstration box for the Scandinavian Box Making Class is shown above, and one of my own demonstration boxes from the weeklong class is shown below. As you can see from the photos we did not get around to applying finish to our boxes. Students felt confident to do that at home. 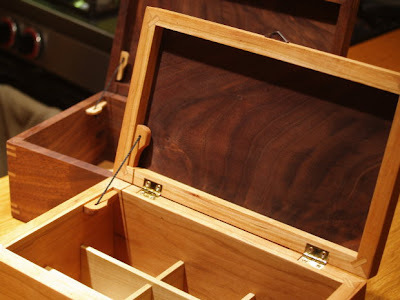 My recommendation is to use a Danish oil finish but to do so when they have plenty of time to hang out with the boxes to make sure they are rubbed out properly between coats. The worst mistake with a Danish oil finish is to simply apply it and walk away leaving it to dry unattended. A sticky mess can occur. Day 4, Simply Beautiful Boxes at Marc Adams School. 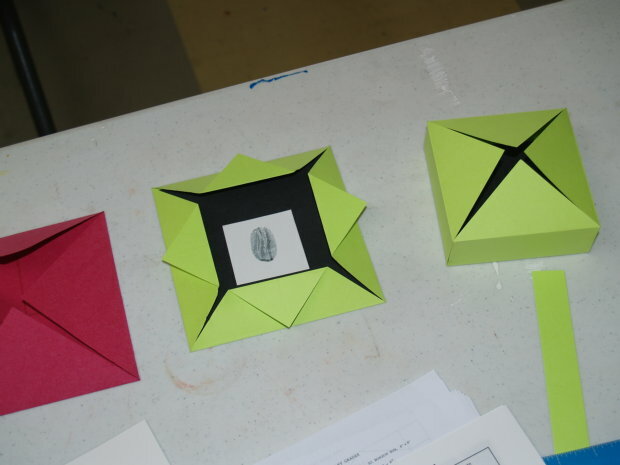 I finished my 4th day of box making class and all my students have made significant progress as evidenced by a collection of boxes in various styles and illustrating a variety of techniques. Today I also took a tour of the other classroom featuring craftsman John Burks, teaching Japanese joinery. It is fascinating work. Meticulous, exacting, but also satisfying. Photos of that class are shown below.